If you ask me which is your addictive new cuisine? without any second thought I will say Italian! Yeah I became more comfortable trying Italian cuisine after coming to this country. Thanks to Giada, I learned to cook delicious and wonderful Italian recipes from Food TV. But I admit that I don't like much cheese in my food. 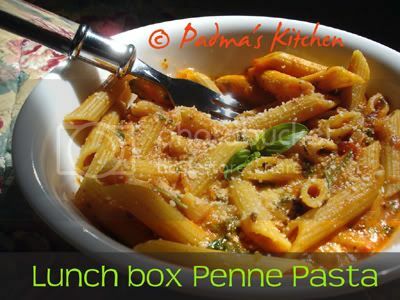 So I adjust accordingly and make paste with penne being one of my favorite shape amongst all. This is one yummy recipe that I tend to make again and again, week after week and never lets me down. I make this weekly once for JB and he loves to take in his Lunch box, thence the name! Cook pasta as per the instructions on the packet. Take a large sauce pan, heat oil and sauté shallots and garlic. Add salt to sweat the shallots and season it with freshly ground black pepper. Now add pasta sauce, chilli powder, salt and let it cook for a minute. Then add freshly chopped parsley, chopped roasted peppers and cream or half-n-half to it. Let it cook for a couple of minutes. Taste for salt and pepper, add the cooked pasta, mix well. Add chopped basil and top it with freshly grated parmesan cheese. Looks delicious. I love pasta, esp the whole wheat ones. Am gonna try it with that. 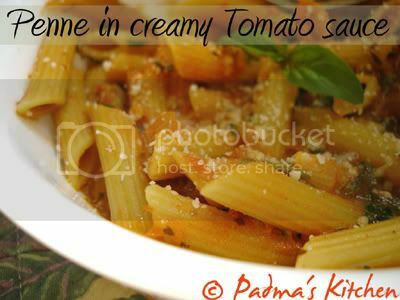 I too love Giada's shows n Italian food..Great recipe..
Looks Yummy Padma...Wanna try all ur pasta recipes!! Am for sure gonna make one this weekend!! Do u have any mexican recipes?? ?